It’s the time of year where anything put on the silver-screen usually falls into two categories for movie-makers. Your film has either been nominated for the academy awards, and the campaign trail begins, or else you’re sitting in the corner, claiming your attempt was a “passion project”, and that awards are for the insecure. However, every so often a film of such quality is overlooked for every major honour that it winds up on the “Oscar snubs” list. Unfortunately for the Coen brothers, they have been overlooked for Best Picture and Best Director, while the only Oscar associated with this film is its leading actor, Oscar Isaac, whose performance has also been deemed undeserving of a nod from the Academy. Sure, its gained nominations for those awards we all turn off before they get to, Cinematography and Sound Editing, but make no mistake, this is “the” snub of the year. 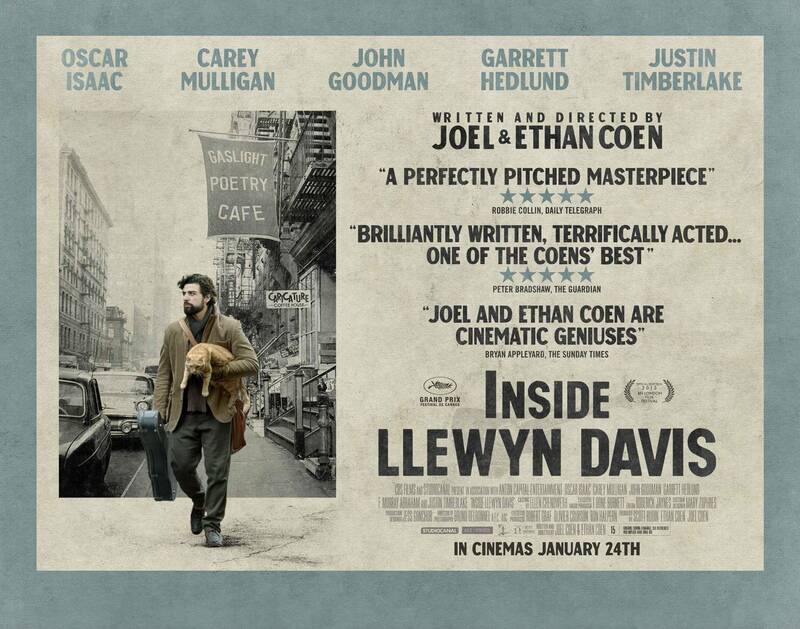 Llewyn, the film’s titular character, is a struggling folk musician. Sleeping on the couches of those who can tolerate him for the night, and playing sporadically in lower Manhattan, his career has stagnated. Sarcastic, self-obsessed, and living in his own grandeur-deluded world, we get to glimpse into the career of an unsuccessful musician after his outlook on music has been tainted, but before he’s ready to give up. Set in the early 60s, the film focuses on a period when folk music was on the precipice of mainstream success. The majority of the film is based in the infamous Greenwich Village, and scenes set in the “Gaslight Café” include the silhouette of a young Bob Dylan, as well an early incarnation on the Clancy Brothers. Any film with T-Bone Burnett(O Brother Where Art Thou?) producing its music should deliver, but a film about acoustic gigs in dark, dusty underground bar will be judged by its live performances. Thankfully, Isaac, Carey Mulligan, Justin Timberlake, and Stark Sands all contribute in delivering what’s sure to be one of the best music-driven films of the year. Llewyn’s career, or lack thereof, is typified by a box of his unsold records that he carts around with him. Talented, yes, but held back by an unwillingness to delve into the mainstream, an unknown genius of sorts. Much like the success of the film, his work is not appreciated by the masses, certainly not enough so to garner the accolades it deserves.